Got this yesterday afternoon near 6PM and after rain and storm. Image by frame of video. 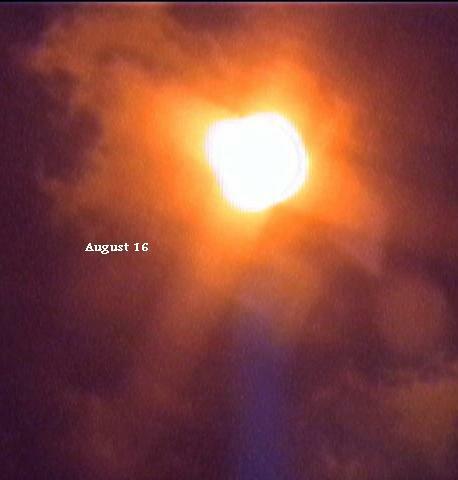 Compare these photos to August 4 and August 7 and August 15 from Alberto, same camera, same cameraman, same location. 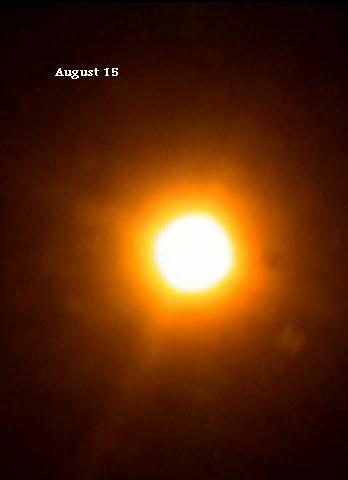 Again, the Sun itself has become a Red Cross when Planet X is in front of it. Becoming larger and more obvious. How large, and how bright, will the cross become? Not as large as the Moon, and also not as bright, as the Moons brightness is reflected sunlight from an object very close to the Earth, and [Planet X] will be some distance until the last days. Combined with the almost violent reactions of the earth upon its approach. Volcanic activity, earthquakes to the extent than almost constant tremors are experienced, and a heat upon the Earth quite outside of any seasonal variation, will add to the sense that something terrible is upon the Earth, which it is! Until the very weeks before the shift, when the reddish complex is so huge that it cannot be missed, the public will be oblivious of the reddish cross in the skies!